An informative and fascinating look at the art and history of falconry by one who has practiced it. Danna Smith grew up with a father who was a falconer and was fortunate to learn about falconry from him. She is the author of a number of picture books. 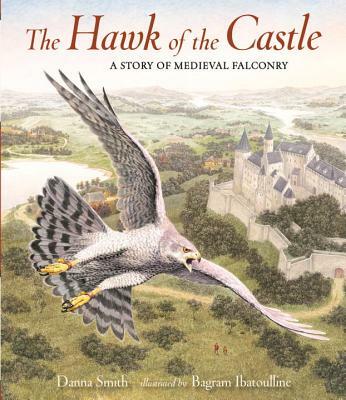 The Hawk of the Castle is her first book with Candlewick Press. Danna Smith lives in northern California. Bagram Ibatoulline has illustrated many acclaimed books for children, including The Matchbox Diary by Paul Fleischman; On the Blue Comet by Rosemary Wells; The Miraculous Journey of Edward Tulane and Great Joy, both by Kate DiCamillo; and The Serpent Came to Gloucester by M. T. Anderson. Bagram Ibatoulline lives in Chichester, New York. Ibatoulline invites you into his sweeping, realistic scenes with cleverly shifting perspectives. But perhaps most thrilling is a book with a castle featuring a girl who’s curious and accomplished, with her social status and marital prospects blissfully beside the point.